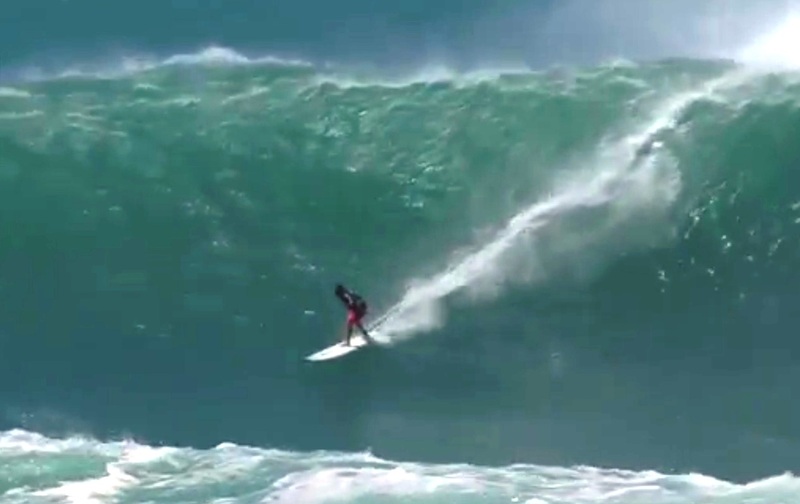 Screengrab World Surf League ‏@wsl Ross Clarke-Jones on an amazing wave! The waves at Waimea Bay rose like angry, 60-foot monsters Thursday, ripping surfboards from their leashes and sending spectators scrambling out of the wash as the Quiksilver in Memory of Eddie Aikau finally went off for only the ninth time in 30 years. Star-Advertiser. Was your Internet connection downright sluggish on Thursday? You can probably blame it on the Eddie big-wave contest. Hawaii News Now. Thursday was an unofficial holiday for many Hawaii workers who were glued to their screens watching big-wave surfers take off on monster swells. Star-Advertiser. A key state Senate committee advanced a bill Thursday to increase the state’s cigarette tax despite objections from smokers who say that extra tax burden will weigh most heavily on low-income residents. Star-Advertiser. On the eve of the last day of the Native Hawaiian constitutional convention, foes held their own aha on Oahu on Thursday night to speak out against the Maunawili gathering. Star-Advertiser. The Other Aha: Hawaiian Independence Backers Make Their Case. Aha Aloha Aina 2016 rejects the Nai Aupuni process for self-governance and insists on pushing for “real” independence. Civil Beat. Hawaii lawmakers are pushing a bill to ban employers from accessing employees’ personal social media accounts. So far, more than 20 states have banned employers from snooping in employees’ personal accounts. About a dozen others are considering similar bills this year. Associated Press. Two victims’ rights measures are still alive this session at the Hawaii Legislature, and one of them was passed with amendments by the Senate Committee on Ways and Means on Wednesday.Civil Beat. China, while criticizing the U.S., says it will participate in RIMPAC. Star-Advertiser. The legislature is advancing a bill to crack down on illegal mopeds. Some lawmakers say this could be the year for passage of strict requirements. Hawaii Public Radio. A Hawaii economic group says the state’s expansion remains on track thanks to a bustling construction sector, but global conditions this year could derail growth. Star-Advertiser. Hawaii residents are more likely to have a college degree than their mainland counterparts, but may not be reaping the same economic benefits of higher education, according to statistics analyzed by the Hawaii State Department of Business, Economic Development and Tourism. Civil Beat. Hawaii Circuit Court Judge Virginia Crandall tossed a lawsuit Thursday that sought to invalidate a number of Honolulu City Council votes on the municipality’s controversial $6.6 billion rail project that were made under questionable ethical circumstances. Civil Beat. A lawsuit that sought to invalidate key Honolulu City Council votes cast for the rail project was dismissed in state Circuit Court this morning. Star-Advertiser. A judge has dismissed a lawsuit that sought to invalidate Honolulu City Council votes on the city's $6 billion rail project over conflict of interest claims. Associated Press. Hanauma Bay will reopen to the public on Friday now that the preserve’s bathrooms have been fixed, according to the City and County of Honolulu. Hawaii News Now. The city and HART broke ground today on the first group of rail stations for the Honolulu Rail Transit System -- the Don Quixote store, West Loch and Leeward Community College. KITV4. The mother of a boy who disappeared from school and was found hours later in Waikiki, is suing the Department of Education. KHON2. Hawaii Electric Co.s' top half-dozen executives all earned more than a half-million dollars in salary and other remuneration in 2015, with the head of the company taking in nearly three times that amount, according to Hawaiian Electric Industries’ recent filing with the Securities and Exchange Commission. Civil Beat. Kai Kahele, recently appointed by Gov. David Ige to fill the Hilo state Senate seat of his late father, Sen. Gil Kahele, holds a low-cost state land lease for oceanview property in West Hawaii that is legally required to be his primary residence. But Kahele, 41, instead listed the Keneki Place, Hilo, home he now co-owns with his mother as his residence when he entered his name for consideration for the nomination to the seat vacated by his father’s passing. West Hawaii Today. A Hilo Circuit Court judge officially remanded the Thirty Meter Telescope’s land use permit this week, setting the stage for another review by the state Land Board and a new contested case hearing for the proposed project on Mauna Kea. Tribune-Herald. A bill to raise the speed limit on Saddle Road cruised past the state Senate Committee on Transportation and Energy on Thursday. Tribune-Herald. The Department of Land and Natural Resources announced Thursday the selection of Lino Kamakau as Division of Conservation and Resources Enforcement Hawaii Island branch chief. Tribune-Herald. Rocker Sammy Hagar Helps Longtime Montessori School Expand. Maui Now. Maui County has agreed to pay $7,500 to settle a lawsuit brought by a man who served more than 20 years in prison for a sexual assault conviction that was later dismissed. Associated Press. At least for now, open agricultural burns by Hawaiian Commercial & Sugar Co. will go on as planned after a 2nd Circuit judge granted the state Department of Health's request Wednesday to strike a motion by a Maui group and Maui residents to immediately halt cane burning while a lawsuit on the matter is pending. Maui News. The state Land Use Commission ruled Wednesday that the proposed construction of a homeless campground near the entrance of Lahaina town would require a district boundary amendment, which would undo the project's current application for a special use and conditional permit before the Maui Planning Commission. Maui News. Shipments between Honolulu Harbor and the three Maui County ports were down in 2015, compared to the previous year, according to intrastate shipper Young Brothers. Maui News. Kauai police evacuated a Lihue home and neighboring properties this morning after a man found a 60 mm mortar round at his father’s home, Kauai County police said in a news release. Star-Advertiser. Kauai Police gave the “all clear” Thursday night after a bomb scare in a Lihue neighborhood. Garden Island. The Kauai Community Alliance outlined plans Wednesday to help about 350 homeless people on the island. Garden Island.